YouTube, as one of the most popular video and audio websites, has embodied over hundreds of interesting videos and wonderful songs around the world. Hence, someone wants to download YouTube audio for the convenience of enjoying them anywhere and anytime. Today, I am glad to introduce you how to download audio from YouTube. 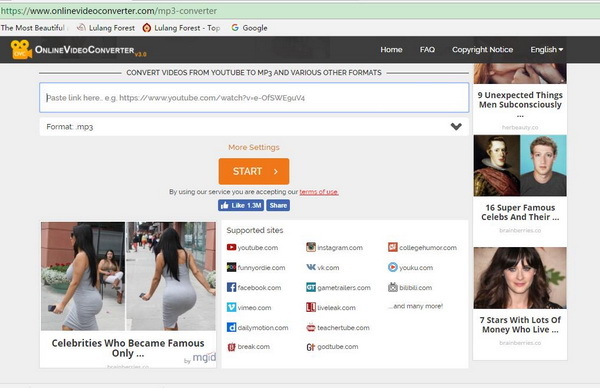 Online Video Converter is versatile software that it supports to download audio from YouTube, Facebook, Vimeo, Dailymotion, Instagram and so forth. The interface and operation of this tool is very easy that you can easily finish downloading YouTube audio in a few steps. Besides, this YouTube audio downloader supports many output audio formats like MP3, AAC, OGG and output video formats like MP4, M4V, AVI, etc. Now let’s learn how to download audio from YouTube with this website. 1. Open the website. I advise to carry out downloading YouTube audio in the Chrome browser. Its network will be faster than that of other explorers. 2. 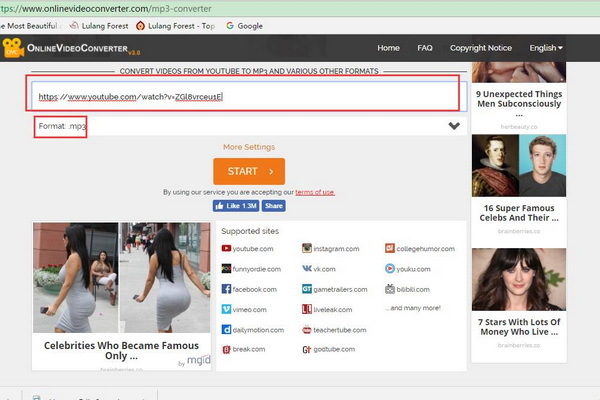 Paste the link into the marked area in this YouTube audio downloader Chrome and choose the output format by clicking "Format" below the Paste box. 3. 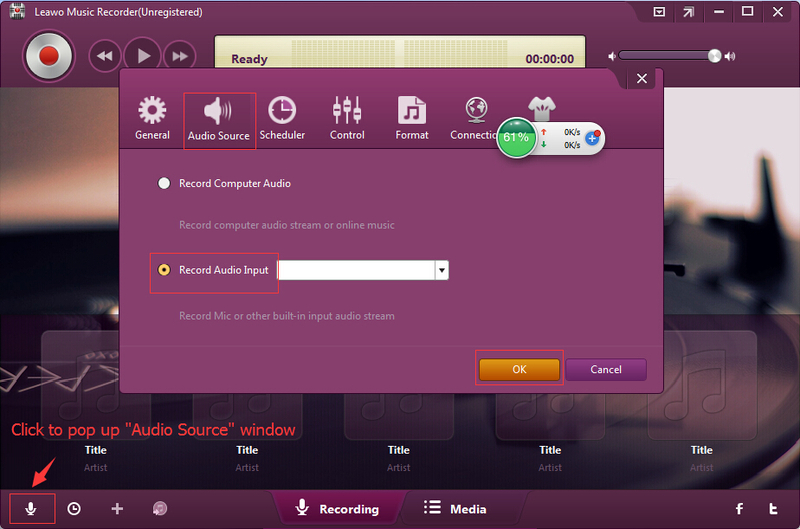 Click "More Settings" to adjust audio quality and set the start time and end time of the audio. 4. Click the big orange "START" button to download Youtbe audio or download audio from YouTube video. 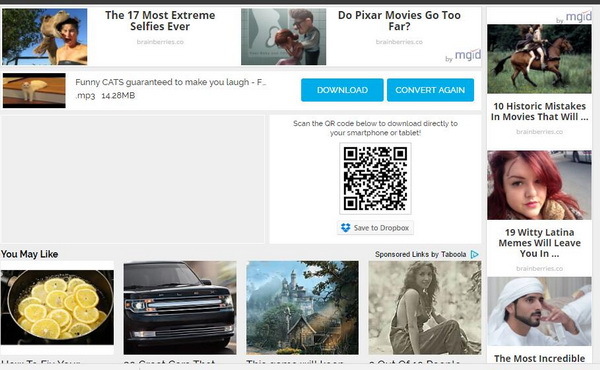 After that, you can click the blue "Download" button or scan QR code to download Youtbe audio directly to your smart phone or computer. You can also use this website to download YouTube audio Mac. When it comes to YouTube audio downloader, Leawo Video Downloader is no doubt the top choice. It is compatible with many audio and video websites like YouTube, Facebook, Dailymotion, iFilm, etc. The YouTube audio downloader is typical for a built-in browser which allows you to browse online video and watch online video directly. Besides, Leawo Video Downloader is superior in many functions that you can download videos and audios, set maximum download tasks at one time and set the output directory. As for how to download YouTube audio, Leawo Video Downloader will provide you with the best solution. Download and install Leawo Video Downloader on your computer. 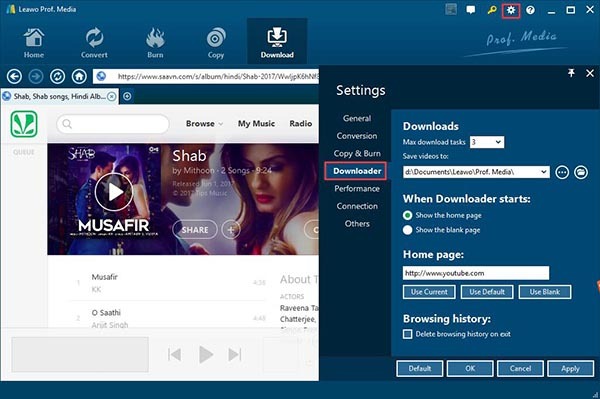 Then launch it to follow the below steps to learn how to download YouTube to audio. 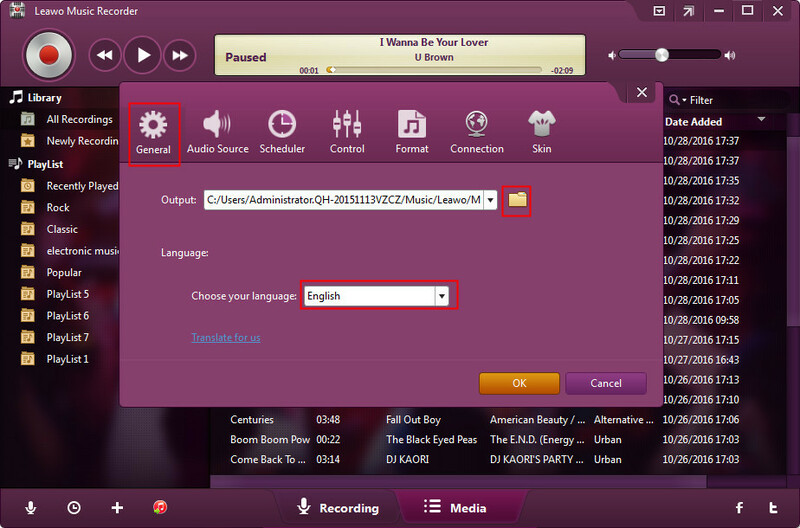 Launch Leawo Prof. Media and open "Download", then paste your audio URL into the browser box. You can directly watch the video in the software, for it has a built-in browser. Click the gear icon next to key icon at the top right to go to "Setting" and then choose "Downloader" to set the target output directory. Click the green arrow on the right of the main interface. Then downloadable audios will show up. You can clearly see the duration, resolution, size, etc. of the audio. Selectively click YouTube audio download icon to download audio form YouTube. Go to "Downloading" at top right to check the progress of YouTube audio downloading. If audio is downloaded, you can see them in the "Downloaded" panel next to "Downloading". Go to the "Downloaded" option and then right click the downloaded YouTube music video to choose "Add to Convert" option. The downloaded YouTube video will be automatically added to the "Convert" panel. 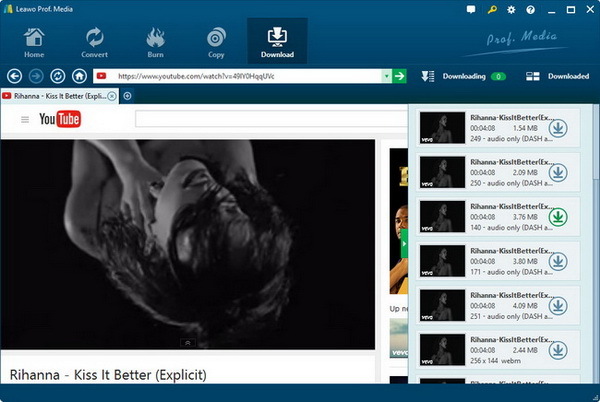 Then, you could extract audio off YouTube music video freely. With output format settled down, go back to the main interface and then click the big greeen "Convert" button. In the "Save to" box, set the output directory to save the final audio files extracted from YouTube video. And then click the bottom "Convert" button. 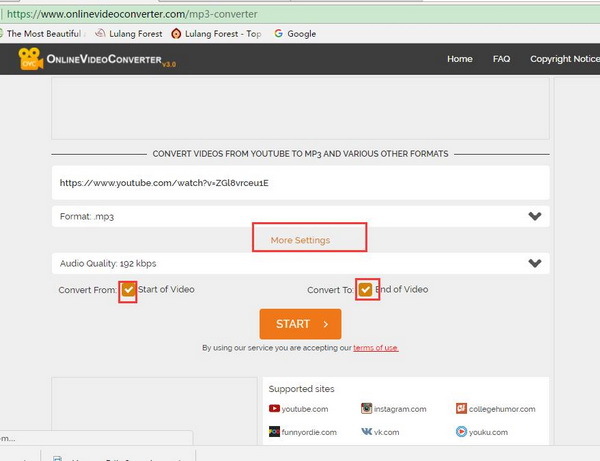 This video converter would start to convert YouTube video to audio file immediately. Leawo Music Recorder is another wonderful YouTube to audio converter that provides professional solution for you to download YouTube audio. 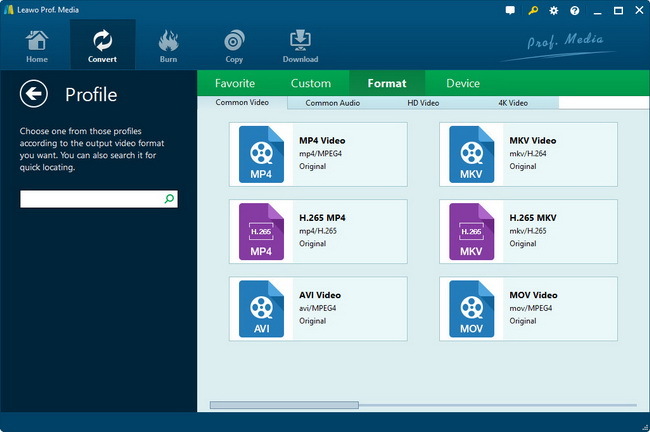 In this software, you can set the output format of YouTube audio as WAV or MP3. Besides, you can adjust bit rate and sample rate to increase sound quality. It supports you to record sound from any audio source including audio like YouTube, Dailymotion, local audio and microphone audio. It also has Task Scheduler and auto-filter, effectively removing ads in the audio. 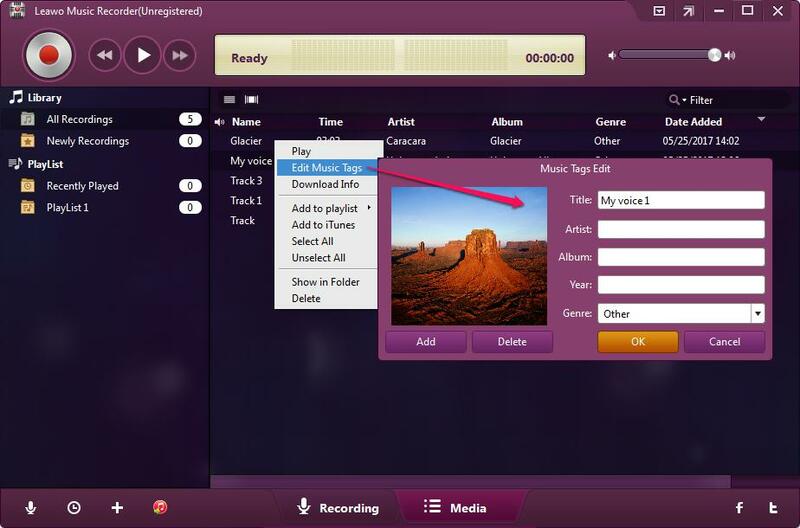 Moreover, Leawo Music Recorder is able to personalize each recording by adding and editing music tags like song name, artist, year and genre. Download and install Leawo Music Recorder. Now the following steps will guide you how to download YouTube audio with Leawo Music Recorder. Click the bottom-left microphone icon or the top-right drag-down box to invoke Settings panel. 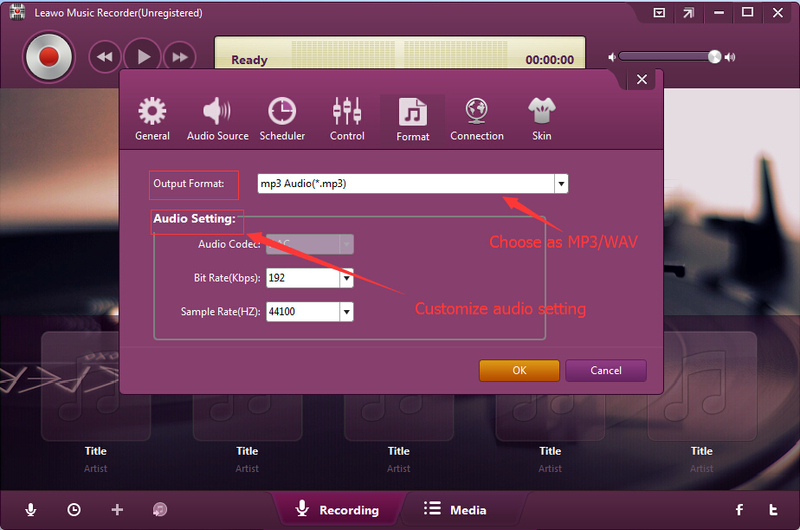 Then click "Format" to select MP3 or WAV as the output format and adjust audio codec, bit rate, sample rate. After that, go to "General" to select the target output directory. On the same panel, you can change the software language. 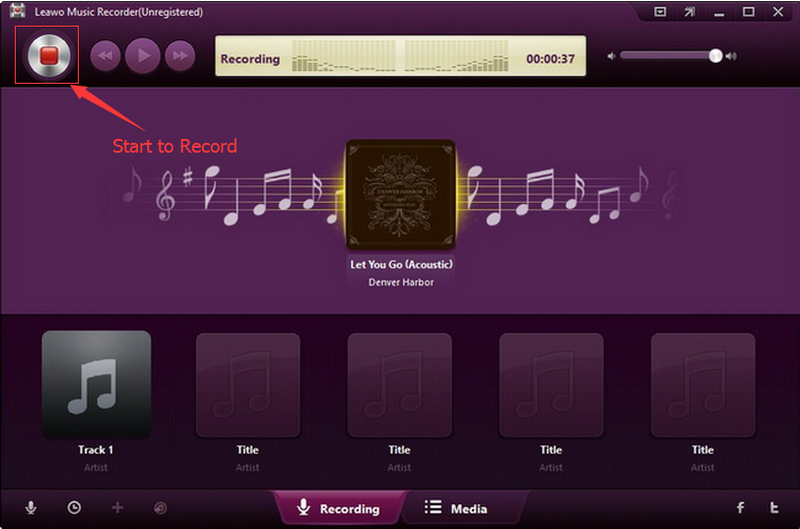 Step 3: Select "Record Computer Audio"
Click "Audio Source" on the settings panel. Since we need to download audio from YouTube, choose "Record Computer Audio" here. Find the YouTube audio you want to download. Click the recording button, then play YouTube audio. Click the button again to stop recording. If you want to download audio from YouTube video, the software can also help you record it. YouTube music tags can be automatically added. If you need to edit music tags, you can right click the recording on the media panel and choose "Edit Music Tags" to edit and add music tags like song title, genre, year and album. If you’re using a Mac computer, Leawo Music Recorder for Mac is a Mac alternative to Wavepad Sound Editor that enables you to record audio on Mac OS 10.6 and later. You can complete downloading YouTube audio online with Online Video Converter, while you have to install the software when you download Youtube audio with Leawo Video Downloader and Leawo Music Recorder. Once you install them, you can easily download YouTube audio in a few clicks. Among these three methods, only Leawo Music Recorder allows you to customize music by editing music tags like song title, artist, album, year and genre after downloading audio from YouTube. In this software, you can also enhance sound quality by setting the output format, bit rate and sample rate. Compared with first and second method, third method is more versatile that it can record any sound from any source including online audio, computer audio and microphone, while the supported websites in the first method and second method are quite limited.